The elegant and classic Hancock pattern is updated with a fresh white glaze and sumptuous platinum highlights, bringing beauty and dignity to every dining experience. 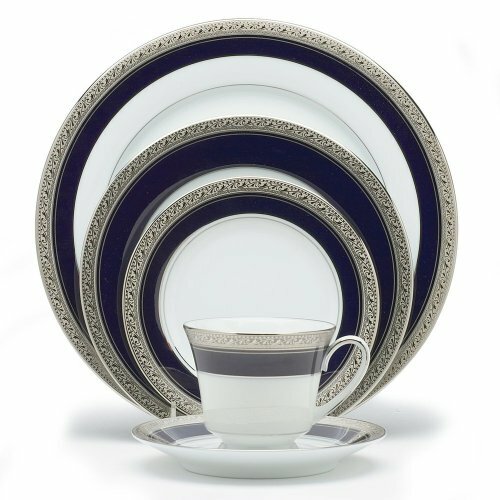 This 5-Piece place setting is crafted of white bone china and each piece bears a black border highlighted by a platinum Celtic knot design and hand-enameled dots. The delicate vine motif of Opal Innocence is enhanced with a silver shimmer for the Opal Innocence Silver 3-piece Place Setting. 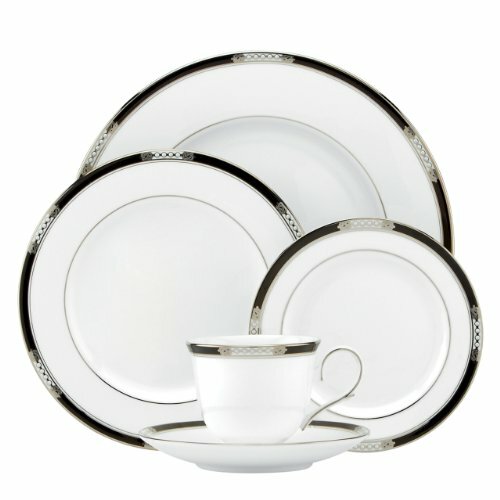 Broad platinum bands and hand-applied enamel dots complete the elegance of this classic dinnerware. The place setting includes dinner plate, salad plate and bowl. Dishwasher safe. The ornate design is a masterful combination of gold and platinum, making each detail look like a precious jewel. Set against the classic backdrop of pristine Lenox bone china, this piece is designed to complement the Vintage Jewel dinnerware. 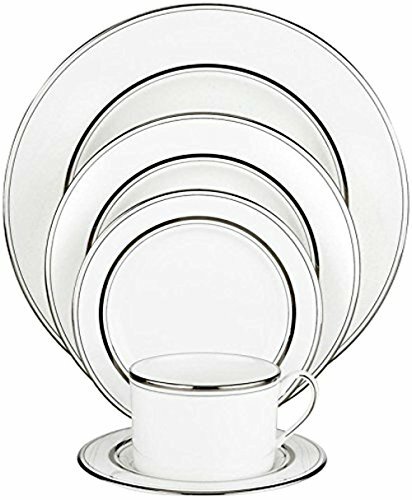 The kate spade new york Library Lane Platinum 5-Piece Dinnerware Place Setting has gleaming bands of platinum that give this kate spade dinnerware a contemporary, sophisticated look. Kate spade Library Lane Platinum China is crafted of fine Lenox bone china and accented with precious platinum by Lenox under license by kate spade new york, which has reviewed this product for quality and authenticity. The kate spade Library Lane Platinum 5-Piece Place Setting includes a 10.75" dinner plate, 8" salad plate, 6.3" bread plate, 5.5" saucer, and a cup with a 7 ounce capacity. Kate spade Library Lane dinnerware is dishwasher safe and made in the USA. 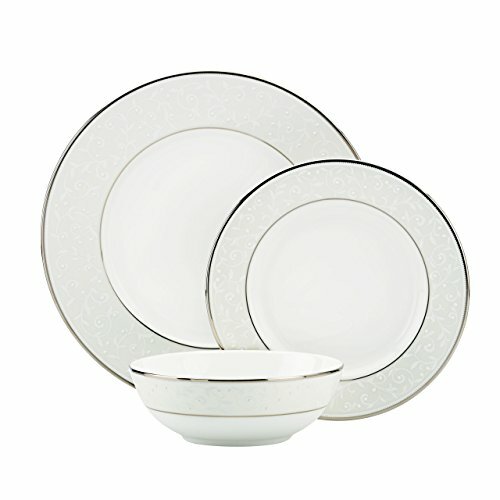 Crestwood Platinum is a pure white porcelain china body, with an embossed, broad, platinum band around the edge. This basic fine china pattern offers elegant simplicity that adapts to any home décor. The set includes eight place settings (place setting is one each: dinner plate, salad plate, bread & butter plate, cup and saucer), eight soup plates, one oval vegetable bowl and one medium oval platter. A raised floral design peppered with enamel dots gives this placesetting its romantic look. The white-on-white motif is framed by rims of precious platinum. This Marchesa Couture platinum-banded charger will add a dramatic touch to your table setting. 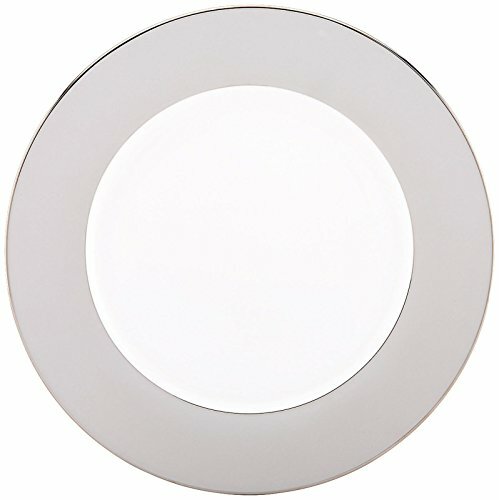 Rimmed in platinum, the charger is designed to be used beneath the dinner plate for a sophisticated table setting. Pair it with Marchesa Painted Camellia or Palatial Garden dinner plates. Diameter: 11 3/4". 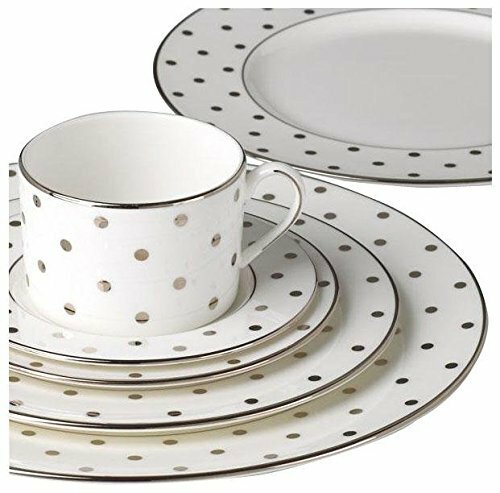 Platinum polka dots sparkle on the kate spade new york Larabee Rd Platinum 5-Piece Place Setting. This white-bodied kate spade bone china is both elegant and fun. The kate spade Larabee Road Platinum 5-Piece Place Setting is crafted of Lenox bone china accented with precious platinum under license by kate spade new york, which has reviewed this product for quality and authenticity. 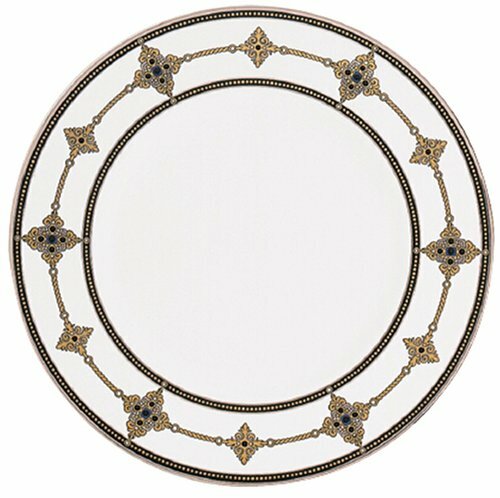 The Larabee Road Platinum 5-Piece Place Setting includes a dinner plate, salad/dessert plate, bread/butter plate, cup, and saucer. Dishwasher safe. Made in the USA. 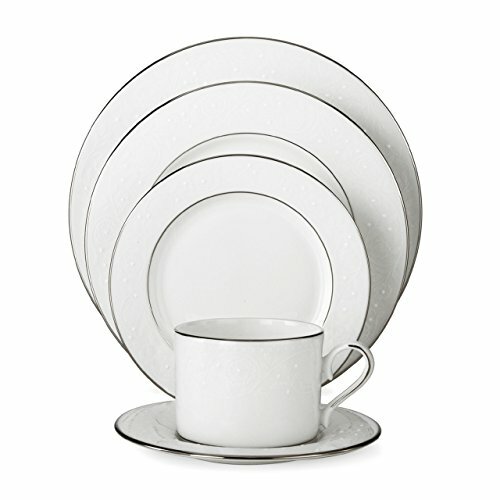 Looking for more Platinum Fine Dinnerware similar ideas? Try to explore these searches: Mats Coasters, Stainless Steel Warming Dish, and Ban Cream. Shopwion.com is the smartest way for comparison shopping: compare prices from most trusted leading online stores for best Platinum Fine Dinnerware, Street Legal Motorsports, Repair Laptop Ac Adapter, Platinum Fine Dinnerware . 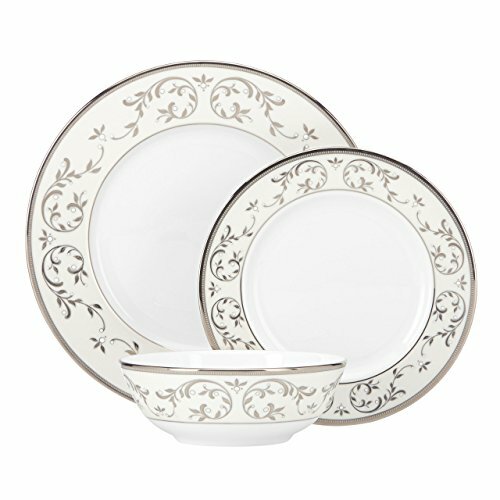 Don't miss this Platinum Fine Dinnerware today, April 21, 2019 deals, updated daily.